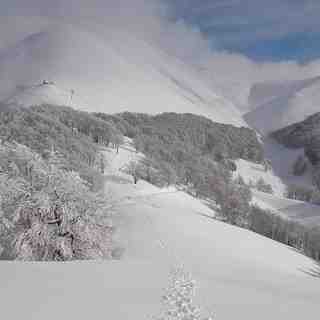 Is it snowing in Terminillo ?¡Gracias! Light rain (totál 3.0mm), mostly falling el viernes por la tarde. Mild temperatures (max 7°C el domingo por la tarde, min 1°C el viernes por la mañana). Wind will be generally light. Moderate rain (totál 18.0mm), heaviest el lunes por la noche. Mild temperatures (max 9°C el lunes por la tarde, min 3°C el martes por la mañana). Winds decreasing (vientos fuertes desde el SSO el martes por la mañana, calma por la noche de miércoles). La tabla anterior muestra el pronóstico de tiempo para Terminillo en la altitud específica de 2100 m. Nuestros modelos meteorológicos sofisticados permiten prever pronósticos para la cumbre, la mitad y la base de Terminillo. Para aceder a los pronósticos de tiempo a otras alturas, pinche en la navegación en la parte superior de la tabla. Para una visión general, consulte el Mapa meteorológico de Italy. Visited this resort along with Ovindoli over Christmas and New Year in 2010-11. Though snow was slightly scarce (about a 10cm base and 25cm of fresh-my old snowboard's base suffered a few gouges). I really liked this small steep resort. Only the Carbonale (which has a nice bowl/natural half pipe running just adjacent/underneath it), Cardito Sud and Terminilluccio lifts were running. Both the Cardito Sud and Terminilluccio lifts had open areas to snowboard in and lower down some trees to snowboard between. 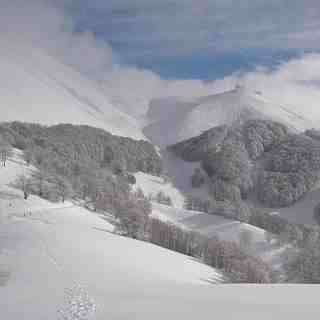 It is worth hiking away from lifts to find some fresh snow. Was very disappointed they didn't open the lift to the highest point as that is probably the steepest section of the resort.